Lemonade From Lemons: Cambodia's Trauma - Too confronting for some. Traveling in South East Asia can be a lot of things: fun, beautiful, delicious. But sometimes, it can also be a very dark place. The latter half of the twentieth century was not so kind to mainland South East Asia, and it’s impossible to ignore the repercussions of this. Over the past few months I’ve learned a lot about the American War in Vietnam, and the Secret War in Laos but nothing was able to prepare me for the carnage associated with Cambodia. In just a 4 year span between 1975 and 1979 over 1.5 million Cambodians (a quarter of the countries population) were killed by their own tyrannical government. The ultra-communist Khmer Rouge, sought to destroy everything modern and turn Cambodia into a giant agrarian collective. They killed every intellectual, person of wealth or political official, evacuated all cities and basically propelled the country back to the Stone Age until they were overthrown by the Vietnamese. Aside from watching the movie The Killing Fields, in high school, I knew very little about this dark chapter of history. I think it’s impossible to visit Cambodia and not be informed about this, however I'm torn as to whether I want to go visit these places myself. The more I read and learn about what went on inside S21 for example, I get anxious and fearful, I feel overwhelmed and confronted by death. I feel the grief to my core. I have shed many a tear while in Cambodia. The saddness is everywhere. Men and women, young and old without limbs, without a means to support themelseves or their families. They beg, they sell odd 'tourist' junk in a hope of making enough money to eat that day. Then there are the children. The orphans, or even those fortunate enough to have living parents, roam the streets begging for money or some food. You can not avoid the trauma and suffering, but to visit the places where so many deaths occured ? I'm just not sure I can do it. I hope this does not come off as selfish - I'm calling it self preservation, for now at least I can not visit or bear witness to these horrific events. I will continue to read and educate those around me on the countries history in the hope that we can inspire more people to come visit all this beautiful country has to offer. The people here rely so heavily on tourism, it seems the only way I can really help them on a greater scale. By spreading the word if you like. 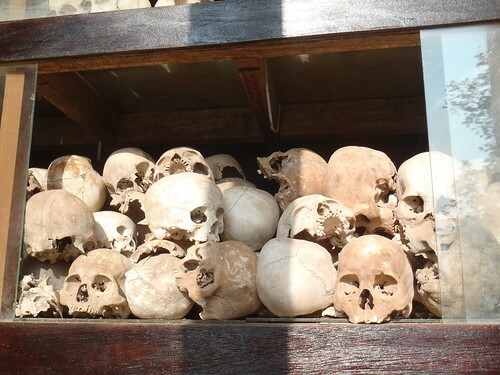 There are a number of sites in Cambodia known as the Killing Fields. They are all mass graveyards where thousands of people were executed- usually beaten to death to save valuable bullets. The most famous of these fields is Choeung Elk, about 17km outside of Phnom Penh, which is now a memorial site. There is the Buddhist stupa which towers over the field. This monument is filled to the top with human skulls. Many of the skulls have been damaged or smashed in. They stare out, eyelessly bearing witness. 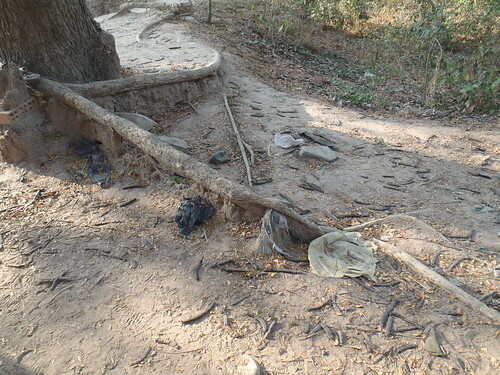 What is left now in the killing fields are a series of mass graves, some have been excavated, others are merely labeled pits. After heavy rains bone fragments and teeth are known to rise up out of the dead land but even after months of no rain, dozens of scraps of clothing are visible, reaching out of the earth like disembodied hands. 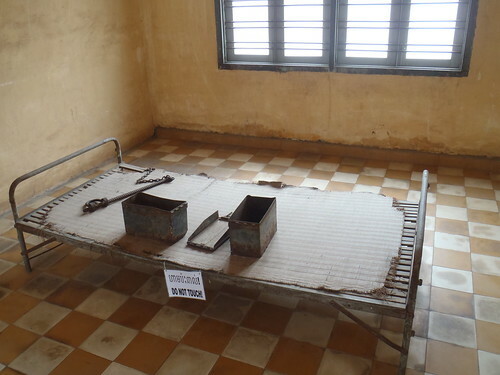 Tuol Sleng Genocide Museum, or S-21, was once a high school, haphazardly converted into a Khmer Rouge prison. It’s new role was primarily the gruesome torture and execution of political prisoners. The government’s idea of what constituted a political prisoner was pretty liberal- men, women, children and even babies were imprisoned here, over 20,000 people total. Of all of the people who entered the prison only seven walked out alive. Yes, that is correct, seven. Most others met their ends in the killing fields. I believe the Killing Fields would be heartbreaking, but I consider S-21 to be absolutely horrifying, a place of nightmares. The buildings have been preserved basically as they were in 1979. Large classrooms with metal beds and torture instruments made up one building. Another has been subdivided into prison cells the size of coat closets, dark and claustrophobic. Barbed wire lined the outside, a sign tells how it was to prevent prisoners from committing suicide. It’s hard to even conceive of the amount of misery that occurred inside these walls, but there are pictures to help. 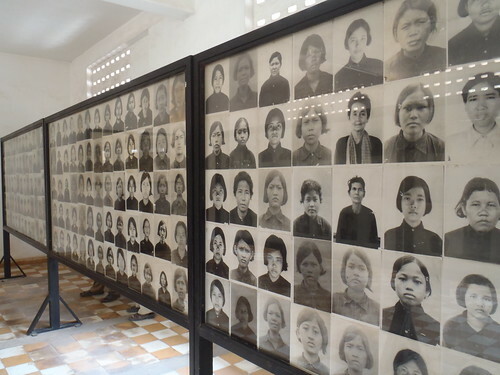 The Khmer Rouge took mug shots of every person who was incarcerated here, these blown up shots are now posted on chalkboards all through the museum. Walls and walls of faces, young and old, thin and beautiful, scared and tough. It adds a heartbreaking touch of humanity to his harsh place. I simply could not cope with this. I know it's essential to be aware of the world around you, the experience the context of every country you visit- and you can’t just get it from Wikipedia entries or photos. However staring at those forgotten scraps of cloth, tearing their way out of the ground, or the picture board of victims even in photograph only I think I better understand the Cambodia of today- a place that is troubled but very optimistic. I’ve never seen more smiling people than I have in this country. And, in the same way that knowing someone's secrets makes you feel closer to them, I think I now love Cambodia a little more. I hope this is the case for you too. Would love to hear what you think of this article. Education is a huge reason I write, I hope even one person has learnt a new fact, albeit sad and dark, about Cambodia. I felt many of the same things as you. We also chose not to go to some of the hard places, and that was the right choice, for us, at this time. And we loved Cambodia too. Thank you Jill not only for the compliment but for understanding my decision. Hi There - I am a member of a baby forum from Australia :) I just read your blog - it was facinating! But, no update sin a year?